A lot of you were wondering what I was doing in Asia last year, and more specifically Seoul. Of course it was the food, booze,(and seeing family), but it was also the opportunity to make my first doc! About 3 years ago, James Minor introduced me to singer/songwriter Bobby Choy who goes by the name 빅 포니 Big Phony -- I immediately fell in love with not only his melodic and melancholy songwriting, but also was so intrigued by his story of growing up alone in NYC when he was a teenager, starting his music career in his late 20s, and then giving up his life in the States and moving to Seoul to reconnect with his heritage. And in 2015 he not only played at SXSW (solo and with punk band No Brain), but he also had a leading role in the film Ktown Cowboys. I knew I had to document his journey. And then make a scrapbook. 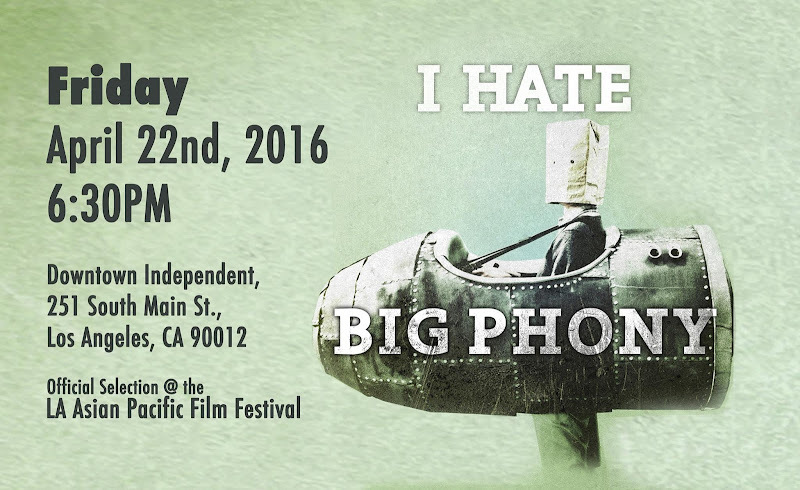 Please join us for the World Premiere of "I Hate Big Phony" on Friday, April 22nd at the Downtown Independent Theater. BONUS: Many of you are in the film and I didn't get releases signed. (please don't sue). BONUS BONUS: Bobby will be at the screening -- and we're organizing an after-party to listen to his new DEATH METAL album! *Bonus. Bobby Choy AKA Big Phony will be at the screening.